REDDING, Calif. - Simpson University is pleased to announce the hiring of former pro athlete Greg Cadaret as its new baseball coach. Cadaret, a left-handed pitcher, played professional baseball for 18 years, 11 of those in the major leagues. He pitched for the Oakland A’s during the 1988 World Series and later played for the New York Yankees, Cincinnati Reds and Anaheim Angels. "We are excited to welcome Greg to the Red Hawk coaching staff,” said Simpson Athletic Director Joe Griffin. “His level of baseball experience playing in the majors and his coaching experience makes him a great hire for us. He has been hitting the recruiting trail hard, and I am anticipating improved results with his strong work ethic and vast experience." A Redding-area resident since 1994, Cadaret has coached at all levels of baseball, including teams in the American Legion and Golden Baseball League, as well as at Foothill High School, where the team won three section championships. For six years he ran the Redding Colt 45s summer collegiate team. 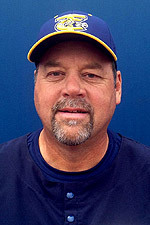 He served as Simpson University’s assistant baseball coach from 2006-2008. Cadaret has also worked as a Comcast baseball analyst for the Oakland A’s pre- and post-game TV broadcasts, and is spending this summer in Michigan as pitching coach for the Traverse City Beach Bums of the independent Frontier League. "At Simpson we will strive to teach our next generation of leaders the lessons of leadership, ethics, sportsmanship and humility without sacrificing our desire to succeed and win in our endeavors," Cadaret said.